Emerging Markets: The Question Is Why Should You Invest? Why Should You Invest in Emerging Markets? Over the past 20 years, from January 1992 to December 2012, China’s GDP per capita grew about 17 times and India’s GDP per capita grew about 4 or 5 times. These are astronomical increases. Now, think about what this might mean for the public markets if, all of a sudden, people in these countries have more money to spend. What would it look like if they went from living on $2 a day to living on $4 a day? It might be hard for you to imagine living on $2 a day or $4 a day; it probably cost you at least $2 just to get to work today. I remember that it was very hard to get people to think about investing in international markets in the early 1990s. It became much easier as these markets started to do well. By 2006–2007, most investors wanted to buy two things: a condo in Miami and emerging markets. There was nothing else that anybody wanted to be in. 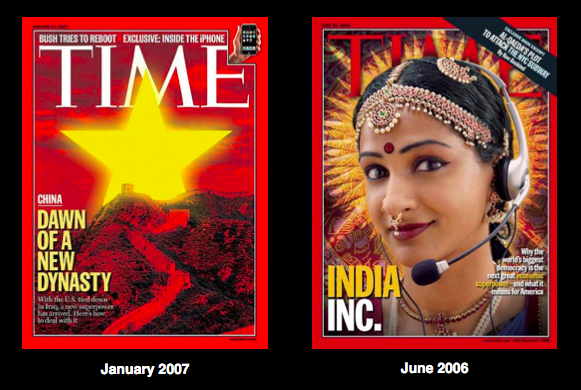 Right around that time, we started seeing covers of Time magazine with such headlines as “China: Dawn of a New Dynasty” or “India Inc.” We all thought emerging markets were going to be the “next new thing” that would take over everything we knew. But in fact, if you invested right around the time of those covers, emerging markets were down roughly 60% from their earlier growth levels. But it didn’t stay that way. In the last year or two, I have found that people are a little reluctant to invest in international markets again, given that non-US markets have done much worse than the US market in the last couple of years. Imagine that you go back 20 years. You have a dollar to invest and you don’t know in advance what will do better: emerging markets or the US stock market. If you put 100% in the US market, you will earn a little more than 8% a year. If you put all your money in emerging markets, you will earn a little more than 8% a year. These results are close enough to be the same. But what if you put these two things together? If you put 50% in the US market and 50% in emerging markets and rebalance every couple of months, you will earn closer to 9%. I would imagine that most investors in the United States wouldn’t put 50% of their portfolio in emerging markets. Emerging markets are riskier than the US market. We don’t want to overcomplicate this scenario with the exact percentage you should have. But the point is that when you diversify, you can earn a better return than you can by investing in only one of these things. But what if you go back the same 20 years and are more reasonable about this investment decision? Instead of 50% in the US market and 50% in emerging markets, you put 50% in the US market, 25% in developed non-US companies (such as the EAFE Index), and the remaining 25% in emerging markets. This is a more realistic scenario. In this case, you end up with a return of about 8.26%, compared with the US-only portfolio return of 8.21%. Because they’re so close, we’ll call 8.21 and 8.26 the same. The question to ask yourself is, If I knew 20 years in advance that I could have a portfolio with 50 countries and 55,000 companies and I’d end up with the same rate of return as a portfolio with only one country and 500 companies, which would I choose? Most investors would choose the diversified approach. This is an example of a way to reduce your risk but end up with a similar rate of return through global diversification. These are probably things we all know intuitively, but it’s good to be reminded and look at them again. When investing in emerging markets looked great and rosy — remember the “India Inc.” cover story — the price for that greatness was generally reflected. The perception of those economies was that they were safe, there was not a lot of risk, they were going to continue to grow, and we all wanted to be a part of that growth. Market prices went up after that story, but as the global financial crisis kicked in, we saw them come down by 60%. Here we are today, and suddenly, the sun is shining on China and India, other emerging markets, and all the risks that investing in those markets can present. 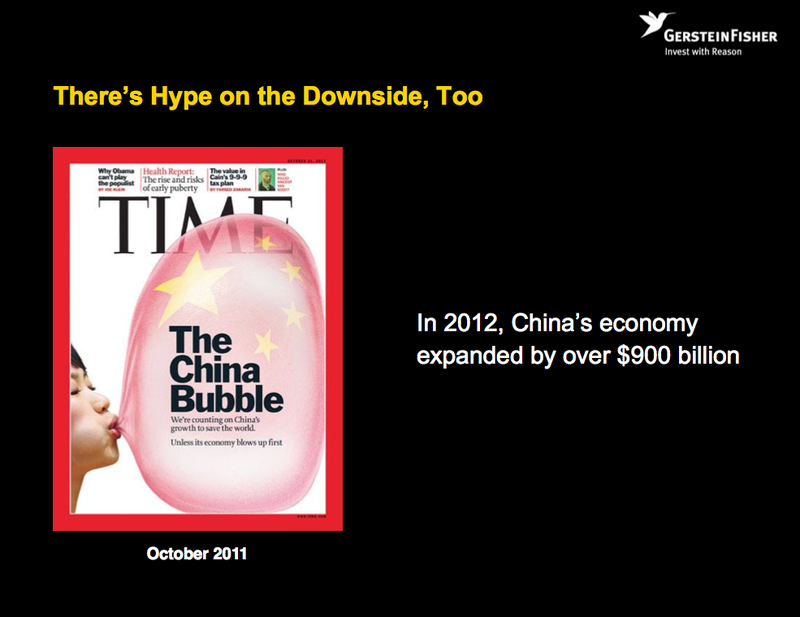 Right after the article, even though it was negative about China and India, China’s economy still expanded by more than $900 billion. It’s popular and attention grabbing to argue that things are cheap or undervalued. I don’t like using such words as “undervalued” because they imply that the market got the price wrong. Low prices simply mean that there’s risk in the emerging economies, the risk is getting priced, and the market price is low. In other words, we all know there’s risk out there, and the prices have come down because of that risk. If risk and return are related, it’s possible that the risk could be rewarded. India’s GDP is approximately $2 trillion, which is about 8% of the emerging markets’ total GDP. 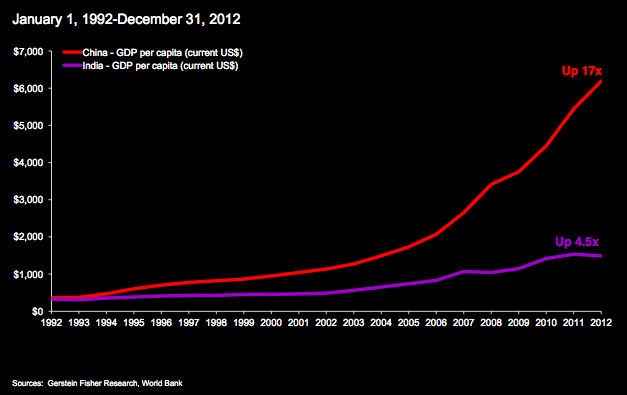 China’s GDP is about $8.5 trillion, or 37% of the total GDP of the emerging markets. 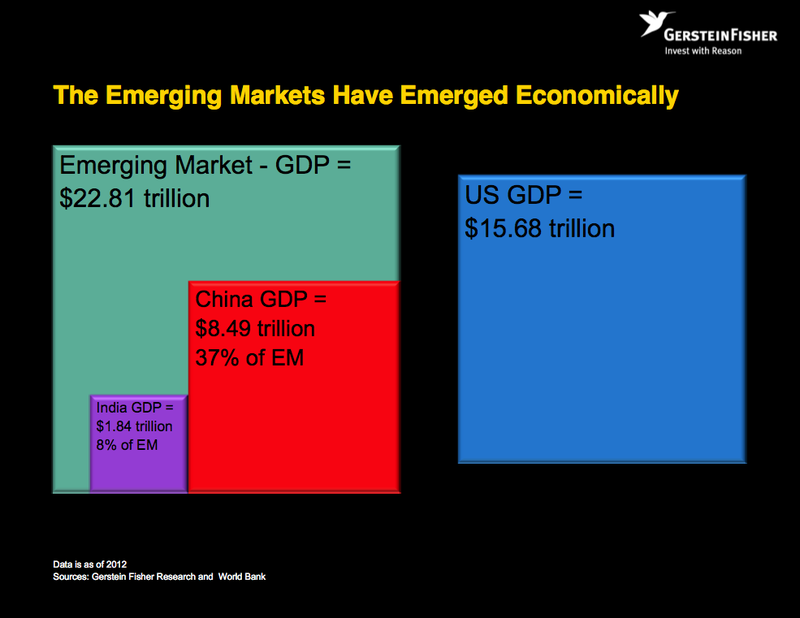 The basket of countries that we refer to as “emerging markets” produces $23 trillion in GDP. You’d be smart to ask, “What does that look like compared with the United States?” The US GDP is about $16 trillion. Now, what about the value of the companies in these countries? The sizes of the boxes reverse. 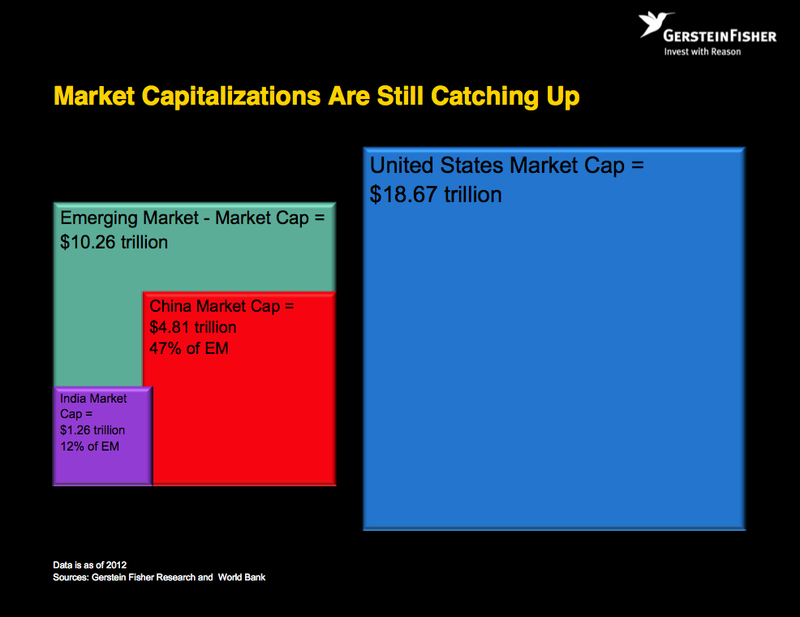 The US market capitalization is greater than the market caps of India, China, and the other emerging markets. US GDP is smaller than the total GDP of the emerging markets, but the US market cap is greater. The way I like to think of it is that the United States has less revenue but a greater net worth. The market and the participants that invest all over the world are willing to pay a higher price for US revenues than they are willing to pay for the revenues of these other countries. You can think about valuing a country the same way you think about valuing a company. Most of us are familiar with the concept of a price-to-earnings ratio. What is important about the price-to-earnings ratio, in my opinion, is the price. There’s a ton of information contained in the price. Fundamentally, what is the price of a stock? It is the collective opinion of lots of people all over the world, doing all kinds of analysis, thinking about what things should be worth, and eventually giving the stock a price. Ultimately, the price of a stock is the collective opinion of everyone. That’s the price. For our purposes, we can relate the price to the market cap of a country. If we take every stock in the country and go through that exercise, the market cap of a country is like the collective opinion of everyone who’s buying and selling securities. The market cap is the average of all those opinions. Now, we have to determine earnings. We can pull earnings from companies’ financial statements, but where do we get those numbers for countries? In my mind, GDP is about as close to earnings as we’ll get. We can think of market cap to GDP as the price-to-earnings ratio. Then, we can apply this approach to these countries. What you see when you do that is that the market is pricing US earnings at a significantly greater multiple than the earnings in India and China. Why do you think that would be? Why would rational people put a lower price on the earnings, revenues, or production in India and China than on the same things in the United States? There are some issues with using market cap to GDP in financial analysis. It’s not meant to be a complete assessment of each country, just an illustration. Remember that it takes a while to adjust GDP because it comes from government agencies, and so the release of GDP data can be delayed weeks or months. If the fundamentals in China, India, and other emerging economies are not tremendously different today from what they were in 2006 and 2007 and if the story remains relatively the same but the market price is significantly lower, what process are investors using to determine that they liked the emerging markets in 2006 and 2007 and they don’t like them now? Author: CFA Institute ContributorsThe CFA Institute Enterprising Investor blog is a forum for delivering practical analysis of current issues in finance and investing. The blog is written for investment professionals and aims to elevate the most interesting and compelling commentary and perspectives from the sea of opinions and research; to contextualize the many educational offerings of CFA Institute; and to provoke debate and an exchange of ideas among serious investment practitioners about topics of the day. The CFA Institute Market Integrity Insights blog is a forum for providing analysis and commentary on the integrity of global capital markets. From regulatory reform and corporate governance to insider trading and financial reporting, our content experts explore timely issues in financial regulation and other issues affecting the global capital markets. In addition, CFA Institute publishes a variety of blogs covering our live events programming around the world, including the CFA Institute Annual Conference, now in its 65th year; the European Investment Conference; the Middle East Investment Conference; and the Asia Pacific Investment Conference. Please note that the content of these blogs should not be construed as investment advice, nor do the opinions expressed necessarily reflect the views of CFA Institute.